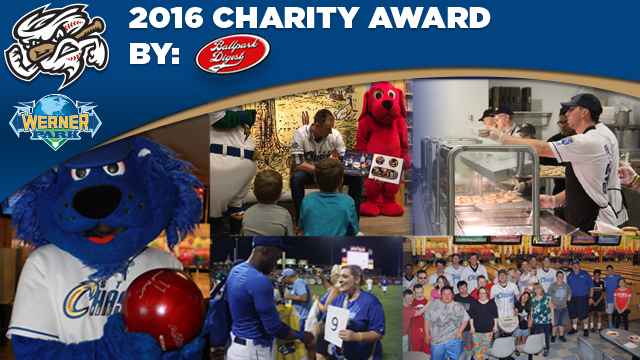 Community work honored by publication with "2016 Charity Award"
The Omaha Storm Chasers have been announced as the recipient of Ballpark Digest's "2016 Charity Award" for the organization's work in the community throughout the 2016 season. The Storm Chasers were also a finalist for the award in 2015. "Our organization is truly humbled to receive this award," said Storm Chasers President and General Manger Martie Cordaro. "While we give back to our community because we believe we have a responsibility to do so, it is still rewarding to be honored. I personally thank Ballpark Digest for recognizing our staff as industry leaders in giving back." Among the highlights of the organization's 2016 charitable work included providing a platform for 74 non-profit organizations at Werner Park as the "Community Organization of the Night". Over $20,000 was raised through the McDonald's and Huber Chevrolet Hurl the Pearl promotion for the Ronald McDonald House, in addition to over $23,000 donated to local charities, including Let's Go Miles, Nebraska Organ Recovery and Methodist Hospital Foundation through four Game-Worn Jersey Auctions. A full overview of the Storm Chasers' 2016 Community Relations efforts can be found online at www.omahastormchasers.com/community.